Use code EASTER10SY for 10% off at the checkout. Not valid for VIP tickets, hotels, camping and extras. If code is used incorrectly, your order will be cancelled. This ticket allows general access to Sea You Festival 2019 on both festival days from Saturday 13th July 11am - Sunday 14th July 10.30pm. 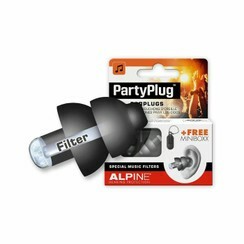 Use code EASTER5SY for 5% off at the checkout. Not valid for VIP tickets, hotels, camping and extras. If code is used incorrectly, your order will be cancelled. This ticket allows general access to Sea You Festival 2019 on Sunday 14th July 11am - 10.30pm. The campsite is just a 12-minute walk from the festival site. Campers have access to the lake (Tunisee) where waterskis and wakeboards can be rented from Friday until Sunday. Shower and toilet facilities, and food and drinks available on-site. Parking spaces can be found 100m from the campsite. Access to Field Camping A is possible from Friday 12th July until Monday 15th July. The ticket includes 5,00€ trash deposit which will be returned. **NOTE** This ticket does not grant festival access! Festival tickets / day tickets have to be purchased separately. The camping ticket is only valid with a festival ticket or day ticket. This B&B Hotel is located in the Marchwald Forest and is just 5 minutes from the A5 motorway and a 10-minute drive from Freiburg city centre. The property offers 80 guest rooms, simply furnished and include a cable TV and a private bathroom. A buffet is served each morning in the B&B Freiburg-Nord’s bright breakfast room. Snacks and drinks are available 24/7 from the vending machine. Zähringen Train Station is 1.6 miles from the B&B. Freiburg Main Station is a 5-minute journey away. Located near the French border, B&B Hotel is just 10 minutes from the old town as well as the train station. 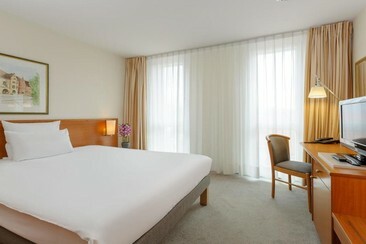 The hotel has a range of single, double and family rooms available all equipped with soundproof windows. Enjoy a delicious varied breakfast in the hotel's breakfast room and there are snacks and drinks available in vending machines. Pets are welcome to stay for an additional fee. Free on-site parking is also available. Freiburg is surrounded by the picturesque nature of the Black Forest as well as scenic vineyards. Leisure activities (within 20km) include mountain biking, hiking and swimming. This 3-star eco friendly hotel is located in the Vauban district of Freiburg and is just 3.5km south of the city centre, situated between the city and nature. The 49 guest rooms at the hotel are all furnished using local, environmentally friendly materials and include a TV, a private bathroom and free Wi-Fi internet access. Guests can enjoy a healthy breakfast each morning and a variety of food can be enjoyed in the contemporary snack bar. Restaurants in the surrounding area can be reached within a few minutes by tram. The main train station to the hotel is the tram line 3 Vauban and exit is at the stop Paula Modersohn-Platz. 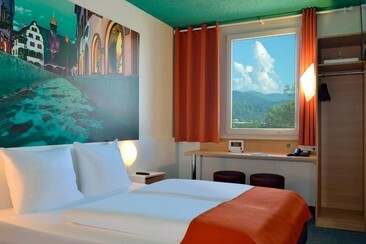 Situated directly opposite Freiburg main station, this three star hotel offers great transportation links into the city. All 152 guest rooms are modern with soundproof windows and include a satellite TV, a minibar and some offer views of the city and Black Forest. Guests can enjoy a delicious extensive buffet breakfast and free newspapers in the morning; during the rest of the day, the restaurant serves international and regional cuisine and the hotel bar offers snacks and cocktails. All guests receive a free transportation card to roam about the city. 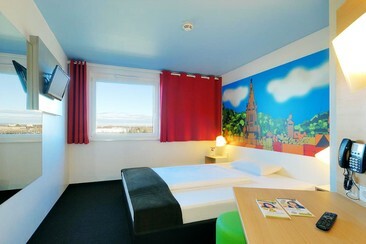 Holiday Inn Express Freiburg - City Centre hotel enjoys a central location southwest of the Altstadt or Old Town. It's an hour's car or bus ride to EuroAirport Basel-Mulhouse-Freiburg (EAP). You can walk to the main railway station in 15 minutes. The hotel is also a four-minute walk to Heinrich-von-Stephan-Strasse tram stop, with frequent connections into the city. The art treasures of the Augustinermuseum are 20 minutes away by foot, and it's the same distance to Freiburg Cathedral in Münsterplatz square. The slopes of Schlossberg hill are just east, with excellent views over the city. All rooms are soundproof, air-conditioned, a safety deposit box, a flat-screen satellite TV and a desk. Free toiletries are provided. The rooms also feature a private bathroom with a shower and a hairdryer. Free WiFi is available throughout the property and on-site parking is also offered. 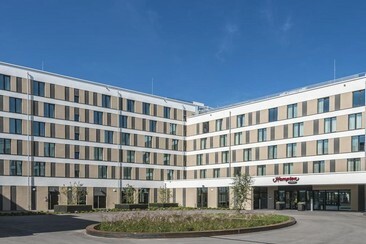 Conveniently located in Güterbahnhof, a new area of the city, Hampton by Hilton Freiburg is close to museums, restaurants, shopping centers and the historic old town. Every room at our Freiburg hotel features a comfy bed, a large work desk, 40-inch smart TV, free Wi-Fi, individually controlled air conditioning, tea/coffee facilities and a laptop-size safe. Accessible rooms are also available. Wake up each morning to Hampton’s hot breakfast, included in your stay and available Monday to Friday 6am – 10am, Saturday and Sunday 6am – 11am. There also have a 24/7 hub with snacks, single serve drinks and amenities. 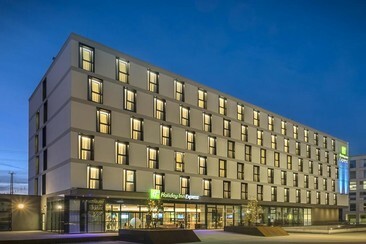 The 4-star Novotel Freiburg am Konzerthaus hotel is situated in the heart of the university town of Freiburg, close to the historical Old Town, and features 219 modern guest rooms and suites decorated with fine furnishings, fresh flowers, and a range of amenities. The hotel also has its own on-site restaurant, La Rotonde, that serves both international and regional dishes in modern surroundings, as well as a rich breakfast buffet each morning that can be enjoyed on the outdoor terrace. The Scotch Corner bar seats up to 40 people, and is the perfect place to unwind with a revitalising drink after a long day. Other hotel amenities include: room service, 24-hour front desk, airport shuttle (surcharge), currency exchange, laundry services, and luggage storage. 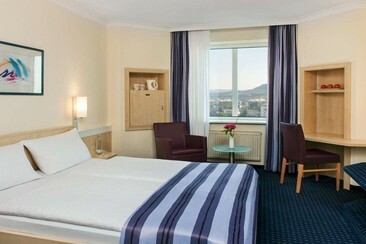 The Novotel Freiburg am Konzerthaus is 100m from Freiburg Central Station. Freiburg Münster Cathedral is a 5-minute drive from the hotel. Sea You festival is now one of Germany's most beloved house and techno festivals set upon the banks of the mesmeric Tunisee, overlooking the serene Tunisee Lake. Known as the 'Beach Republic', the exquisite lake becomes the setting for over 25,000 avid techno festival-goers there to soak up the sun, relax, get involved with water sports, barbecue by the lakeside, or simply party till their heart's content. Premier electronic artists such as 'Mixmag DJ of the Year 2017' Nina Kraviz, as well as the likes of techno stalwarts Richie Hawtin, Paul Kalkbrenner, and Adam Beyer have all been on the roster in previous editions, emphasising the festival's ethos of striking the ideal balance between chilled-out lakeside bliss by day, and raucous partying by night. After it's initial success in 2014, Sea You continues to sell out year-on-year and it's easy to see why when you can so easily immerse yourself in this scenic location. 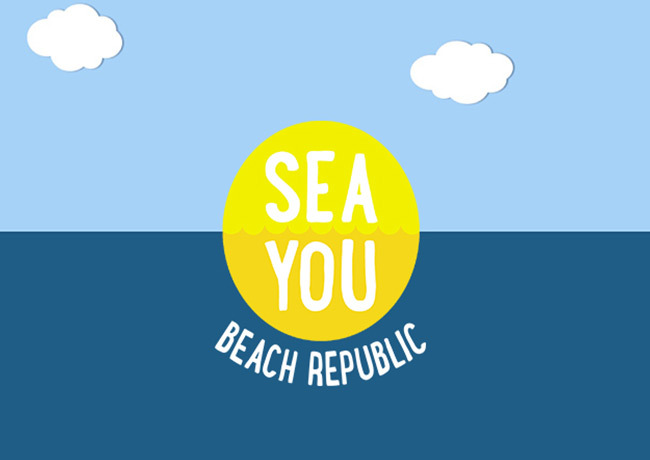 Sea You festival is now one of Germany's most beloved house and techno festivals set upon the banks of the mesmeric Tunisee, overlooking the serene Tunisee Lake. Known as the 'Beach Republic', the exquisite lake becomes the setting for over 25,000 avid techno festival-goers there to soak up the sun, relax, get involved with water sports, barbecue by the lakeside, or simply party till their heart's content. Premier electronic artists such as 'Mixmag DJ of the Year 2017' Nina Kraviz, as well as the likes of techno stalwarts Richie Hawtin, Paul Kalkbrenner, and Adam Beyer have all been on the roster in previous editions, emphasising the festival's ethos of striking the ideal balance between chilled-out lakeside bliss by day, and raucous partying by night. After it's initial success in 2014, Sea You continues to sell out year-on-year and it's easy to see why when you can so easily immerse yourself in this scenic location.